Taste test: Quite possibly the lightest amount of salt and vinegar I've ever tasted on a chip. If you're looking for a salt and vinegar chip, do not get these. Even licking the chip, I could barely taste the vinegar. Don't worry about wincing: There's hardly anything on these chips. Smell test: There is no vinegar smell at all. It smells like robust Russet potatoes. From the package: “For over a century, Garden of Eatin' has been using the finest organic ingredients in our tortilla chips to achieve authentic style and taste. 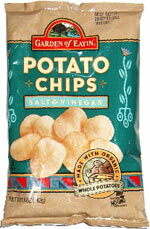 Now, we extend our family's tradition of all natural snacks with the introduction of our new Garden of Eatin' Potato Chips made with Organic Potatoes."